The historic ride continues to get more legendary. Tailback Demarco Prewitt’s third rushing touchdown put Kansas Wesleyan ahead with 46 seconds left, safety Takota Anderson recorded a game-sealing interception, and the No. 6 Coyotes edged No. 15 Dickinson State, 43-40, in front of a packed crowd at the Graves Family Sports Complex. With the win, Kansas Wesleyan became the first KCAC team to make it out of the NAIA Quarterfinals since the current 16-team format started in 1998. Southwestern reached the NAIA Division II semifinals in 1984 when there were just eight teams. Wesleyan’s Prewitt wasted no time getting on the board. The NAIA’s leader in rushing slipped by two defenders and took off for a 54-yard TD with 11:57 to play in the first. The run gave Prewitt sole possession of the KCAC single-season record for rushing touchdowns and yards. The lead didn’t last long as Dickinson State hit KWU over the top with a 72-yard bomb from Hayden Gibson to Tyger Frye, knotting up the score just 50 seconds later. 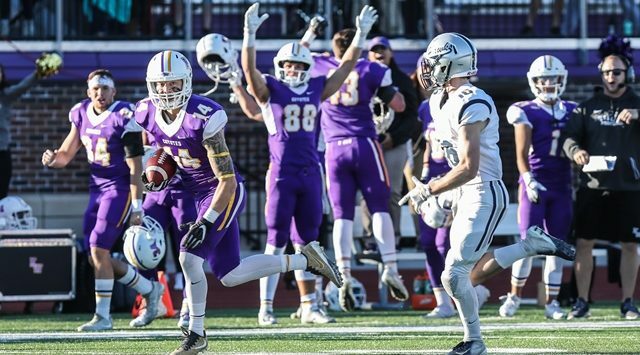 Kansas Wesleyan returned the favor when junior Johnny Feauto fired a rocket to sophomore Charlie Simmons for a 41-yard touchdown, putting the Coyotes in charge with 3:17 to go. Dickinson State put up the next two scores, both on the ground with Ahmad Andrews. His first went for eight yards after a Feauto interception, followed by a six-yard scamper after a punt, giving the Blue Hawks their first lead at 21-14 with 7:29 left in the half. The Coyotes’ answer was a 17-play, 75-yard drive that took 6:56 off the clock, capped off by a Prewitt five-yard plunge with 33 seconds on the clock. DSU didn’t let that stand as the final score of the half. Gibson lobbed two passes to defensive back Jay Liggins, the second going for six from six yards out with no time left. KWU knotted up the score at 28-28 with another lengthy attack. Wesleyan used a 15-play, 82-yard march to find the goal line on freshman KC Carr’s first rushing touchdown of the season on a six-yard jet sweep with 3:35 remaining in the third. The Blue Hawks responded with another explosive play as Gibson found Jarett Lee for a 54-yard strike, but the PAT wasn’t attempted because of a bad snap. DSU quickly forced a KWU punt, allowing the Blue Hawks to have the pigskin to start the final quarter. DSU opened the last period with a 61-yard pass by Gibson to Frye, setting up Dickinson State at the Coyote 20. Kansas Wesleyan’s defense stiffened up, forcing a 37-yard field goal try that was blocked by junior Warren Singletary, the NAIA Defensive Most Outstanding Player of the Game. The special teams stop gave KWU life as Feauto zipped a pass to junior Trenton Poe-Evans for a gain of 57 yards to the DSU 11-yard line. On the next play, Feauto dumped a pass left to senior Marquez Gilmore, who tight-roped the far boundary for a score with 10:51 to go. Dickinson State wasn’t phased as Gibson orchestrated a scoring drive, finished off by a 15-yard pass to Frye with 7:35 left. However, Frye was flagged for unsportsmanlike conduct, pushing back the Blue Hawks, who were unable to get the two-point conversion, leaving the score at 40-35. Kansas Wesleyan then turned to its winning formula once again. In the opening round win over Langston, KWU scored on an 18-play waltz. The Coyotes nearly did the same, punching the ball into the end zone with Prewitt after 16 plays. With one final chance, Gibson was hit by senior Brad Coombs on a pass picked off by Anderson to seal the victory. Prewitt carried the ball 34 times for 185 yards and three touchdowns. Feauto was 16-of-31 passing for 241 yards and a pair of scores while rushing for another 52 yards. Simmons had eight catches for 118 and a TD. Kansas Wesleyan (13-0) stays at home for the NAIA Semifinals when the Coyotes play hosts to the No. 7 Benedictine College Ravens. Kickoff is slated for 1 pm at the Graves Family Sports Complex.